In art, sometimes we get new ideas from looking at something old. At our art school here in Seattle we recently taught this lesson, inspired by historical illustrations of the first passenger-carrying hot air balloons. Students of all ages, from 4-year-olds to adults, had such a great time I decided to share the project here as well. This is a project that can provide useful challenges to little ones as well as teenagers and adults, depending on how you approach it – which makes it a wonderful chance to do art together and play around with all the different ways it can turn out! Use the step-by-step guide for the basic shapes; if you’ve got older artists in the family, add extra ornate details from our examples, or from your imagination. 1. 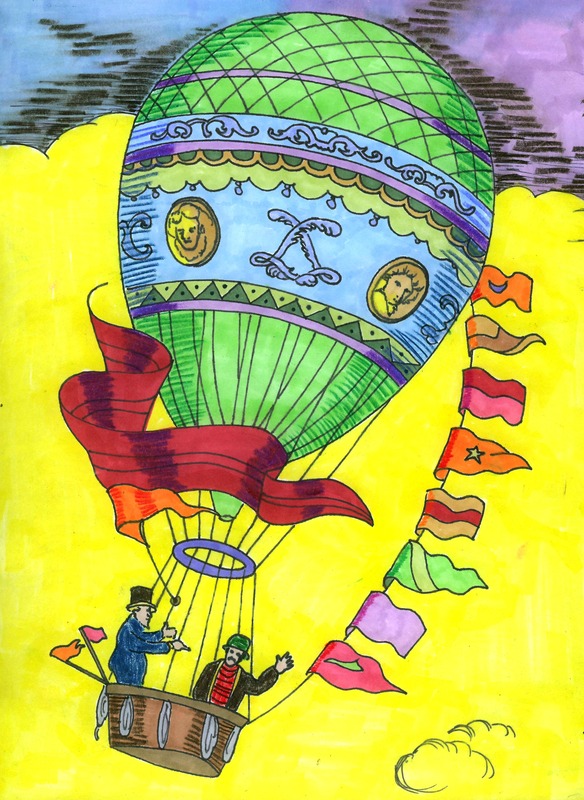 Share a little about the history of what you’re drawing: Hot air balloons were the first way humans experienced sustained flight, before planes or parachutes. Initially they were developed in China, as floating paper lanterns that could signal to people far away. The first passenger-carrying hot air balloons, though, were made in France, in 1783. Before they tried lifting people, they sent one up that successfully carried a sheep, a duck, and a rooster! 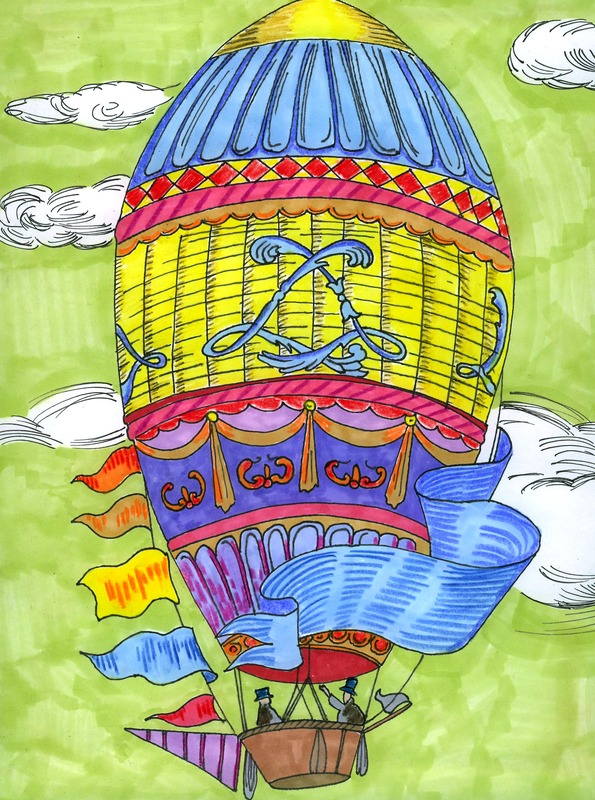 The art examples shown here are all inspired by actual illustrations of those first balloon flights. 2. Sometimes balloon shapes can feel tricky to draw. Don’t worry! Start with the bottom of the balloon, which is shaped a little like the outline of an eye. Trace up from the middle of it with your finger, and make a dot where you want the top of your balloon to be. 3. Take it slowly with the sides of your balloon. Start at your top dot, then curve out to one side before joining up with the bottom shape. On the other side, try to curve out the same amount. It’s ok if your balloon ends up a little pointy on top – some of the first hot air balloons actually were pointy too! 4. Draw two straight lines from the bottom edges, going down to where your basket will be. Add your basket connected below, using curved lines for the bottom and top to show that it is round, not flat. 5. Start your decorations by dividing your balloon into sections, using lines that curve up gently. This trick helps the balloon look full and round, instead of flat. 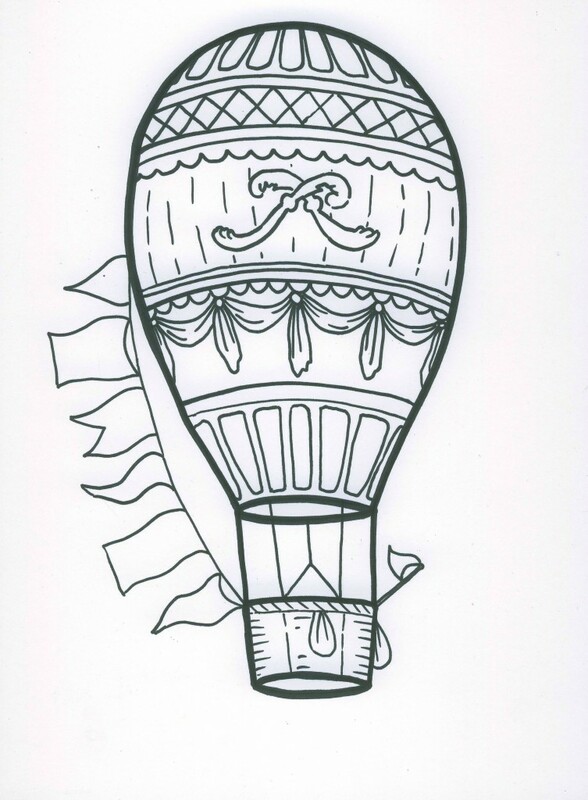 Then fill in different designs and details throughout your balloon. 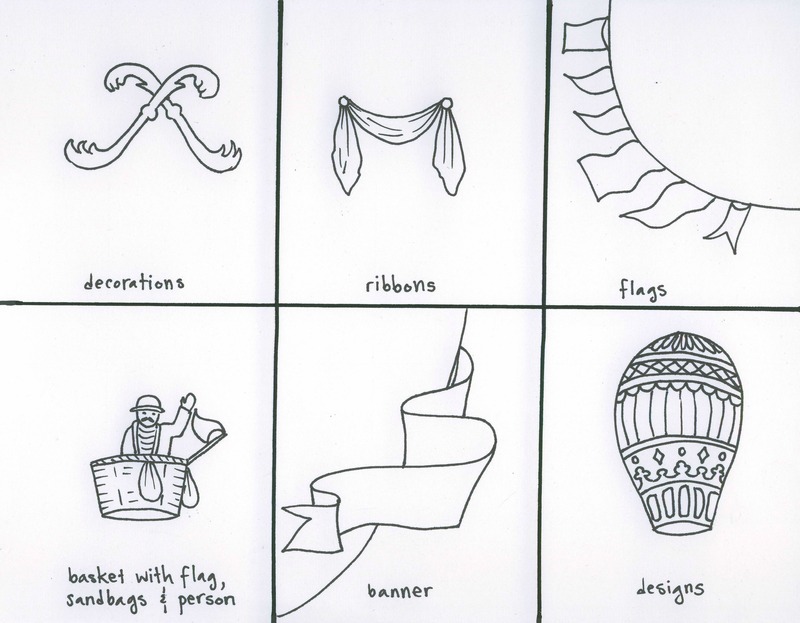 You can look at the examples for ideas, and add others from your imagination. 6. Fill in your colors using the markers or colored pencils. If you want to use both, fill everything in with markers first, then draw extra designs or shading on top with the colored pencils. If using just colored pencil, try filling everything in solidly with very firm pressure – this will help your balloon really “pop” out from the page! 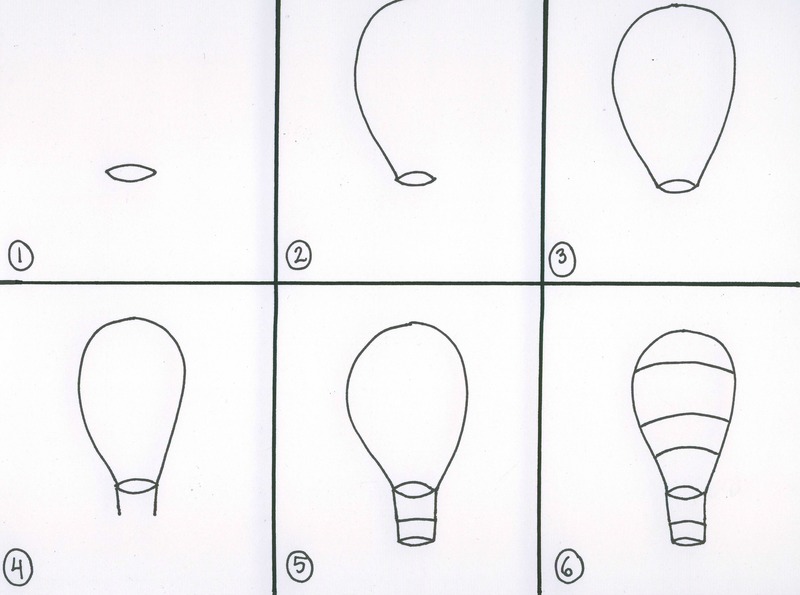 Extra Tip: If your kid gets frustrated about her/his balloon shape at the beginning, there are lots of ways to solve it! You can add extra lines around the original ones, to make the shape you want, and then turn the first lines into part of the design. 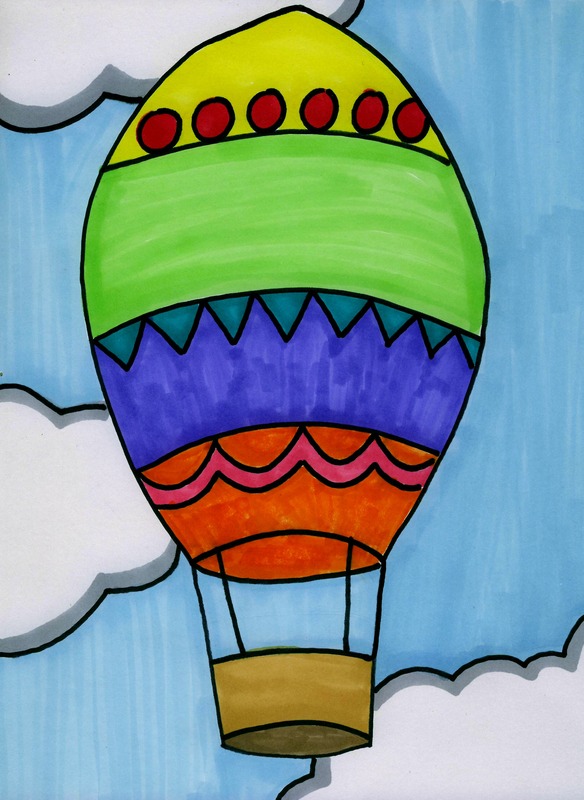 Or, suggest that this balloon is blowing in the wind, or about to land or take off, and isn’t fully inflated – encourage your kid to turn it into a fun scene to draw. When we’re making art, something that seems like a mistake is actually just a surprising new challenge. When we see it through, we can come up with new ideas for our art we might never have thought of before! This entry was posted in Uncategorized by Theresa Harris. Bookmark the permalink.